It’s not exactly as he imagined. But Lauchie MacEachern has reached the goal he set for himself when first enrolling at Nova Scotia Agricultural College nearly 17 years ago. He has a wife. And he has quota. During his second year, Lauchie met Jolene. Although raised on a dairy farm in Cape Breton, Jolene didn’t necessarily have quota. Her parents were still young and not ready for retirement. And as many ways as they looked at farm plans, when they were married a few years later, there were significant challenges to expanding her family farm. Yet Jolene and Lauchie wanted to farm. As a young couple, Lauchie and Jolene weren’t exactly sure how they were going to make this work. They just knew they would. “We wanted to do as much as possible, see the world and try lots of different things so we would be prepared to one day operate our own farm,” said Jolene. Like many others, Jolene and Lauchie headed west to work for a period of time. 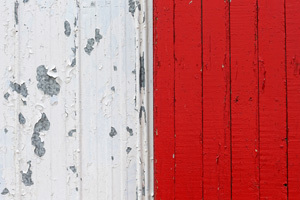 “It didn’t take us long to realize we wanted to make the Maritimes our home,” she adds. A few years after returning home, Jolene and Lauchie were given an incredible and rare opportunity. They moved to Debert, NS and for over six years worked along-side Henry and Janet Eisses before taking over the Eisses’ 300 acre operation. Lauchie, having worked for Henry for a few years after university, was already familiar with the farm. “Henry and Janet welcomed us with open arms and treated us like family,” says Jolene. The MacEachern and Eisses families continued to work together to transition the property. “Because we worked together, the transition was successful.” The MacEachern’s officially took ownership January 1, 2013. 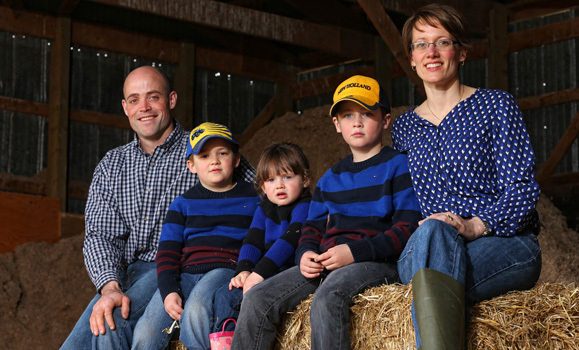 Today, Lauchie and Jolene, along with their three young children, Ewan (seven), Allister (five) and Adriana (three), operate Folly River Farms Limited in Debert, NS. They milk 60 cows, crop corn, barley, soybean, clover and alfalfa and rent-out land for carrot production. “Each day we are grateful for the opportunity the Eisses’ gave our family,” says Jolene. Farming in general is also very important for them. 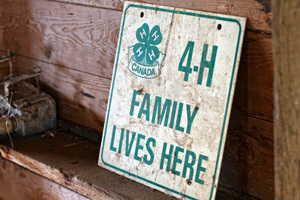 Like many others, Lauchie, Jolene and their children see the importance in knowing where their food comes from. They enjoy producing high quality food. 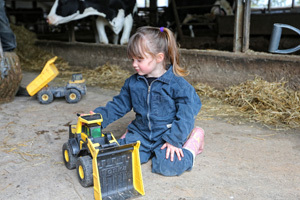 “Raising our family on the farm enables our children to learn essential life skills and shows them what it takes to feed the world.” They also have a very positive outlook and see the value in what they do, aside from the most obvious. Jolene and Lauchie are humble about their success and goals for the future. “It’s the people who support us that make our farm a great place to be,” she adds. Thankfully Lauchie and Jolene aren’t afraid of hard work as their lifestyle isn’t easy. And they will admit that. “Working for yourself and running a business is usually more work than working for someone else,” says Jolene. “But if it’s what you really want to do, do your homework and then go for it,” adds Lauchie. He and Jolene definitely “went for it”. They knew they wanted to farm and they were prepared to work hard and do what was necessary to make it happen. Jolene and Lauchie are loving what they do and so far, haven’t looked back. “When I heard my son say he wanted to be a farmer, I knew we got it right,” says Jolene of Allister’s dream to be a farmer. Thankfully Allister and the other MacEachern children have their youthful innocence. They aren’t (yet) setting bold and ambitious dreams like their father did many years ago. Although the whole family is thankful he did.